Key Largo camping sites are not what you may first think of when considering the pleasures and attractions of Key Largo and the Florida Keys. But why not I ask you? Well, in short Key Largo is known as the diving capital of the world, and from the first moment you hit the US1 or Overseas Highway as it is also known, you will be in no doubt that diving is forefront of everyone’s mind…..spending a night under Canvas……nah not really. It also is at the top of the Florida Keys, which for some reason is an area of the Keys that many people whizz past such is the eagerness to get down to the Southernmost point of Key West, where all the bars and pubs are to be found. But I think you are missing out so much if you fly past the Upper Keys and certainly if you miss out on Key Largo. So I am going to try to convince you to make this part of the Keys a part of your trip to the keys, and whilst you are getting up close and personal with the best that Key Largo can provide under the water, why not experience Key Largo camping too? Find a site down by the water’s edge, where you can gaze longingly at the blue waters and save a few dollars on overnight accommodation, which means that you can spend more during the day to really experience the best that Key Largo has to offer. And believe me it has a lot. So read on for the best Key Largo camping sites information we can offer, and we will let you know the kind of things that each has to offer, as well as a little bit about the surrounding area too. It’s somewhat surprising that a world renowned diving resort such as John Pennekamp also allow you to camp here, but they do for both RV vehicles and tents with useful amenities too. So with a choice of forty seven pitches, and all of them with electricity and water supplies, then there isn’t any reason why you should truly rough it whilst staying at this premier Key Largo Camping location. With picnic tables and grills by each other pitches then you can gran a few burgers and sausages and cook happily, as the skies darken around you and the biggest starts you have ever seen in your life twinkling high above you. If you are concerned with keeping clean whist undertaking some Key Largo camping, then don’t worry. The site has both laundry and a highly cleaned shower block, with good toilets and hot showers. Situated right on the Florida Bay, Kings Campground is a bit of a hidden gem, and is often reviewed highly. With a publix just up the road, you certainly wont go hungry, and can easily buy whenever you need it, so you will have no issues keeping food fresh whilst camping. This is really my kind of Key Largo camping experience, and has a nice mix of natural freedom and a bit of luxury whenever you want thanks to the supermarket. With full laundry facilities and well kept showers, you will be surprised that you had to go looking for Kings Kamp, as it isn't really advertised that well but has a lot to offer. Just down the road at the southern boundary of Pennekamp State Park, is where you will find the Bluefin Rock Harbor site. Unlike many of the Key Largo camping sites this has a marina that can cope with quite large boats up to 50 feet in length, and with 5 slips available quite often you can just sail in a moor up. However, with all marinas for the sake of a phone call you can guarantee that you have no issues at all. So for a prime location to explore the best diving sites and scuba and snorkelling companies in Key largo, you can’t really do much better than Bluefin Rock Harbor. However, if diving isn’t your thing, then you can use the swimming pool, cast your fishing rod into the Florida Keys waters, or just have someone cook for you at the Mandalay Restaurant and Tiki Bar. This is one Key Largo camping site that should leave all visitors more than satisfied that they have chosen to stay here. 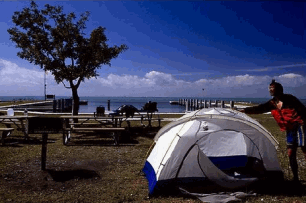 Calusa Campground is another of the Key Largo Camping sites that sits very close to John Pennekamp State Park, so one thing you are guaranteed is wonderful scenery if you decide to camp here. The campground has the Atlantic Ocean on one side and on the other the wonderful Florida Bay, which means you would consider it to be open and free to come and go as you like. But the resort really focus on security as much as any site that I have stayed at, with the only way to enter the area being through a security man who covers the gate at the front. With amenities including a clubhouse, swimming pool, playground, tennis, basketball, biking to name just a few, the kids will be more than catered for. Which is great so Mum and Dad can sit back, and enjoy the sunshine, knowing that there little ones are safe and sound on this well protected camp site. Which is what Key Largo Camping is about after all. The beauty of this resort is that they make plenty of provisions for “Overnight Drop-ins” who are just looking for somewhere to pitch their tent for the night before moving on again. Which is great if you are trying to be as loose and free as you can whilst vacationing in the Florida Keys. This Key Largo camping resort and marina, hold back at least one third of all the pitches, and knowing that you can pull up and have good chance to get a site with both full hook-ups and free cable television a popular choice with Key Largo camping enthusiasts. This is a real family camp site, which provides lots of stuff for the whole family to get involved and enjoy whilst escaping from the pressures of day to day life. If you fancy a day on the beach then the resort can provide two of these, both facing Newport Bay where the sunsets are amazing! However if you are a bit like me and prefer a nice pool instead of dealing with what is swimming past you in the sea, then a heated on site swimming pool is available too. If you like a bit of fishing, and for many of us it is prerequisite for a great relaxing day out, then Key Largo Camping marinas like this one will be right up your street. Bring your tent, cast your rod and have a great day fishing for best of Florida Keys fish, such as Grouper, Tarpon. Snapper, shrimp and many more. This site is very low key, and some people have been put off by the lack of amenities it offers, but hey, if you want everything you could possibly want why ever leave home. If you do want a small, convenient campground with no fills (and even no ice) then you can do a lot worse. Please note though that if you are thinking of booking space for a huge RV, then you are either going have to be very skilled at reversing, or leave it at home as there isn't that much room to drive around. One last thing, this is a pet friendly site with a capital "P", so you should have no problem bringing your favourite furry friend with you if you decide to stay. Simple, low cost, no frills, Key Largo camping! Now this is one site in Key Largo where you definitely won't be spending your nights under canvas, as it is strictly a "No Tent" site. However if you have an RV that you would like to park for awhile then this has options for you. It's not far from the Key Largo kampground and Marina, which is just the other side of the Overseas Highway, and is worth checking out. I haven't been there myself however, so it would be best to contact them directly to ask about their Key Largo camping amenities and possible reservation policies. This is not an official Key Largo Camping site, but is not far away on Elliott Key. The key is part of the Biscayne National park and is a true wonder for folk that really want get away from things for awhile. You will need to travel on a boat, so I'm afraid RV drivers who do all their Key Largo camping from the comfort of their own little home on wheels can give this place a miss. But if you really fancy somewhere that is a bit of an effort to get to, but is well worth it then Elliott Key should be a place to go for. For more information on Elliott Key and the beautiful Biscayne National Park then read more using the link below.